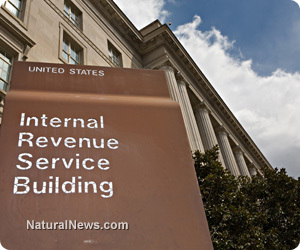 (NaturalNews) The scandal surrounding the Internal Revenue Service's illicit, politically-motivated scrutiny of conservative, patriot, Tea Party and pro-Israel groups continues to expand daily, as more information is learned about its depth, breadth and scope. In addition to delaying tax-exempt status for these organizations, the IRS also demanded donor rolls and printouts of Facebook posts to determine who was contributing to the organizations and what sort of information they were putting out in regards to the current administration, and what books people were reading, according to a Politico review of documents from 11 of the targeted groups. That review "shows the agency wanted to know everything - in some cases, it even seemed curious what members were thinking," the website reported. "The review included interviews with groups or their representatives from Hawaii, New Mexico, Ohio, Texas and elsewhere." Some tea party groups even worried they'd be punished for followers' Facebook comments, Politico reported - a chilling prospect, given the huge First Amendment implications of any such shenanigans. In a long-awaited Treasury Department inspector general report, investigators said the IRS did decide internally that some of those questions being asked of conservative groups were way out of line - especially requests for donor rolls. However, interviews with members of the targeted groups show a much larger - and sinister - portrait, and one that extends far beyond the rudimentary language in the IG report. In that regard, investigators say only that the IRS "requested irrelevant (unnecessary) information because of a lack of managerial review, at all levels, of questions before they were sent to organizations seeking tax-exempt status." Toby Walker, president of the Waco Tea Party, told the website, "They were asking for a U-Haul truck's worth of information." So intrusive and ridiculous the demand for information that some groups seeking tax-exempt status simply gave up in frustration. The IG report noted that many of the groups were asked to provide resumes of their top officers as well as interview descriptions with media outlets. One organization was asked by the agency to provide "minutes of all board meetings since your creation." In one instance, the American Patriots Against Government Excess was asked to provide summaries or copies of all material passed out at meetings. The group had been reading The 5000 Year Leap by Cleon Skousen and the U.S. Constitution. Marion Bower, president of that organization, sent a copy of both of them to the IRS. "I don't have time to write a book report for them," she told the website. As usual, there are apologists for this kind of behavior. Not surprisingly, some of them are lawyers. University of California-Irvine law professor and election law expert Rick Hasen told Politico that it was the tax agency's job to make sure groups applying for tax-exempt status were not primarily involved in campaign activities: "So it has taken a murky rule and tried to resolve disputes about status in some cases using a very fact-intensive and intrusive inquiry." Continuing, he said, "It would be far better for the IRS - or even better, Congress - to have a bright line rule about who has to disclose what and keep the IRS out of this line of inquiry. For example, make every group regardless of tax status disclose major donors funding election ads to the FEC. That's it. Then there would be no reason for political groups to take the (c)(4) status and the pressure would be off the IRS." But that doesn't explain why only groups of a particular political persuasion were targeted - which makes the IRS actions look very much like some of the agency's personnel were purposefully twisting the rules to the benefit of the party of President Obama. This scandal continues to unfold, and we'll be on top of it.